The FW1000 Series has been discontinued. Please see the FDT7000 Series as a possible alternative or contact our Flow Engineering Department. The FW1000 series are minimally invasive, low-cost segmented wedge flow sensors. The segmented wedge element provides a simple and reliable restriction for sensing flow as related to pressure differential. 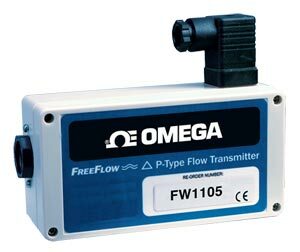 The FW1000 design allows users to install the meter in any full pipe orientation (horizontal, vertical or inverted). It is compact and rugged measuring less than 254 mm (10") long and 89 mm (3½") wide, with a flanged mounting base for simple installation. This series is offered with several ranges of calibration to accommodate the requirements typical to process water applications. Three standard NPT port sizes are available to accommodate installations. The standard unit can also be converted to a 1 to 10 Vdc output in the field.